◆ Stunning Full HD 720P Video at 25fps. Record and Playback via local microSD Card. Support SD card up to 32G. ◆ Quick WiFi setup via iPhone or android smartphone using the App. Seamlessly stream video and 2-way audio directly to your smartphone, tablet, or Windows PC. ◆ Remarkable Field of View with Super Wide degree Viewing Angle 355 degree pan and 90 degree tilt. Remote Pan/Tilt on your phone anytime, Intelligent Digital Zoom, and IR LED Night Vision Up to 32 feet. ◆ Stay in Touch with Two Way Talk, Intelligent Motion Alerts, Email Alerts/Snapshots as well as Mobile and Web Apps. You will never miss any important minutes. ◆ Kindly refer the User Manual before use. And plug in the power when you use it because there is no built-in rechargeable battery supply in the camera. Support Full 1-Year FREDI Manufacturer Warranty and 24/7 online Professional Service, Please contact us if you meet any problem. ● This camera also features video stabilization, and IR (Infrared) night vision, it can shoot clear videos even in the dark! ●Two-way audio, With Built-in speaker and mic, easier listening and responding to what is going on when watching. ● It supports micro SD card up to 32GB. This device requires a micro SD card (Sold Separately) to save video. 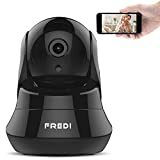 This entry was posted in Discount Photography and tagged 2Way, Audio, Baby, Black, Camera, Day&Night, FREDI, Indoor, Monitor, Night, Pan/Tilt, Play, Plug, Remote, Security, Viewing, Vision, WiFi by Ball Photo. Bookmark the permalink.